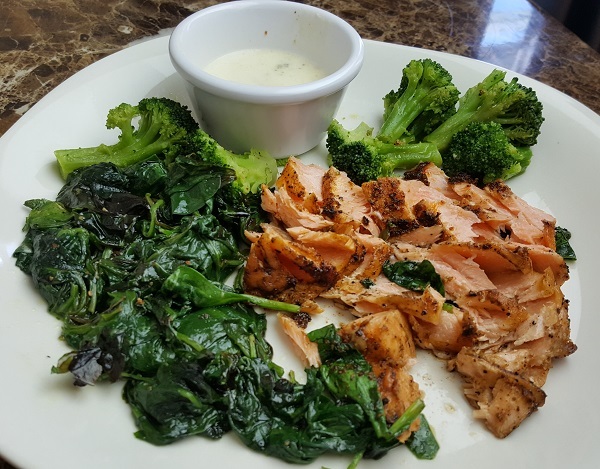 I’ll share what I ate with a detailed photo tour of my low carb meals & macros, plus my MyFitnessPal diaries so you can see how I logged those meals. Remember when my doctor put me on an antidepressant for problems with stress, anxiety and insomnia? Well that didn’t work (Celexa). I literally saw zero difference in four full months, even when he doubled the dose halfway through. So almost two months ago he switched me to Lexapro, and after a few weeks I woke up one day and DID feel a difference! 🙂 But I also started having vision problems too, which have gotten increasingly worse in short time. Meaning: my vision has gone to complete sh*t. I can’t even read speed limit signs at this point! I researched both issues, and it seems it’s definitely related to the Lexapro – which is the only thing new/different in my life (besides being fat and blind, lol). 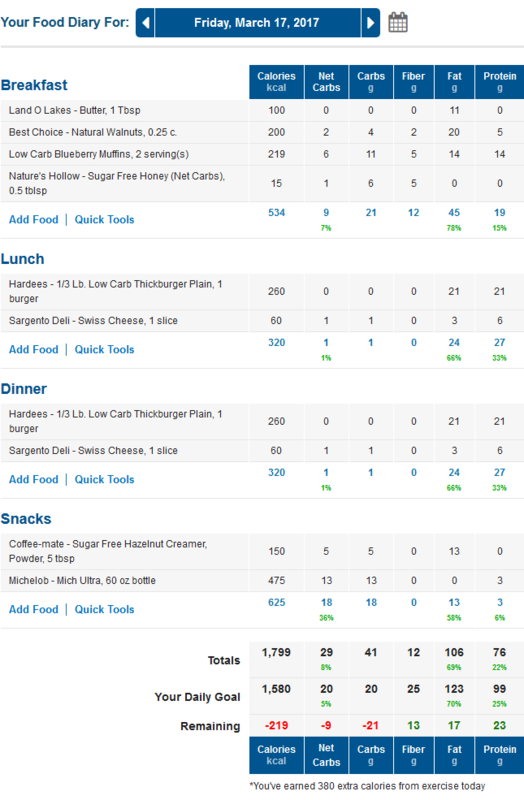 I actually ate off plan a couple times to try to shock my body back into ketosis. Last Saturday my weight was way up to 149.8 (after being 134.8 at the beginning of the year). 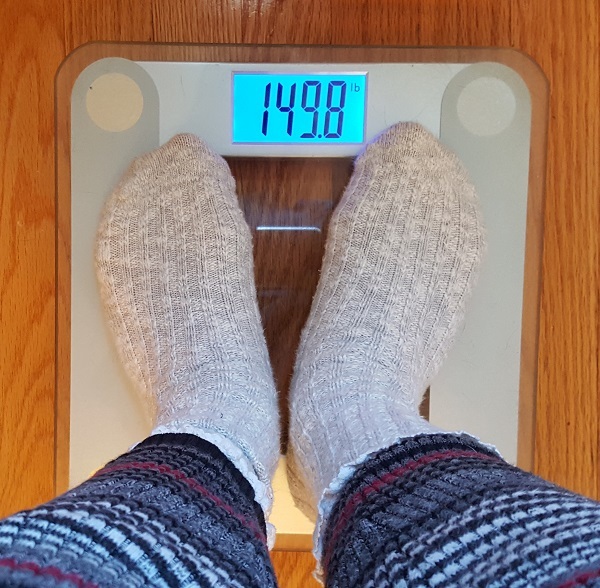 This Saturday – today – I was back down to 144.6 pounds, so I’ve lost 5.2 pounds in the last 7 days just eating low carb. When you’ve been super lean… 10 or 15 pounds heavier, and water weight bloat, feels MISERABLE. 😛 Even though I’ve lost over 5 pounds this week, I haven’t had keto flu – and I can tell my body is not in ketosis. Obviously I’m going to have to wean myself off the Lexapro and talk to my doctor, but in the meantime – ugh, this is just plain frustrating! Anyway, to see what I’ve eaten this week to lose just over five pounds, you can see Saturday & Sunday’s meals here, and then Monday & Tuesday’s meals here. 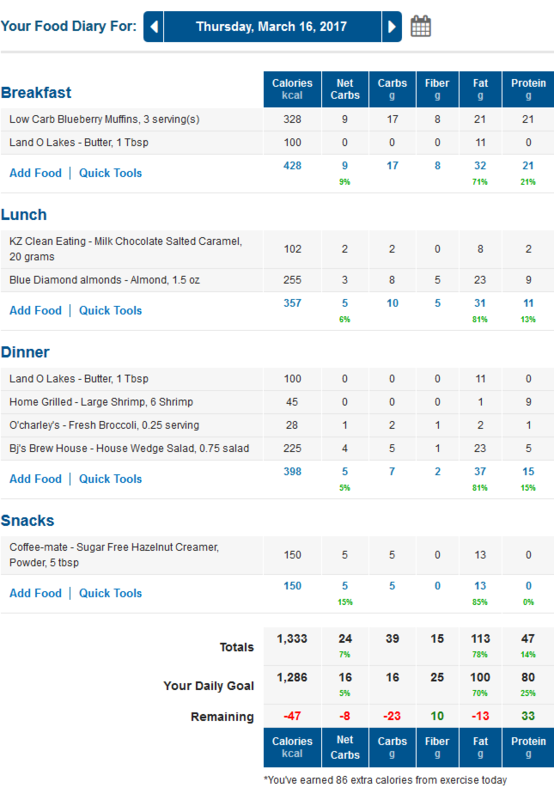 And below is what I’ve been eating for the last three days… including some delicious low carb blueberry muffins I made this week! 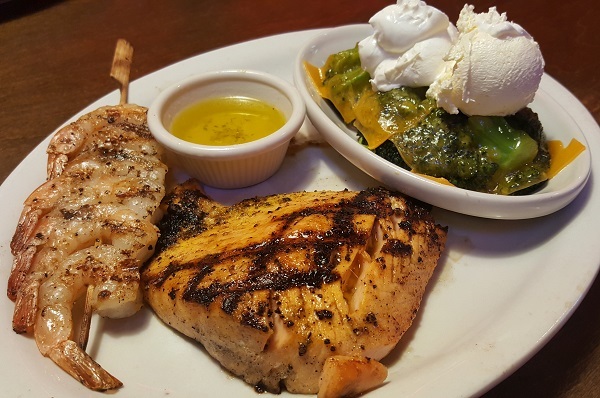 For lunch I had leftover grilled salmon & veggies where I went out to eat the night before, and only ate half my meal – because it was huge! 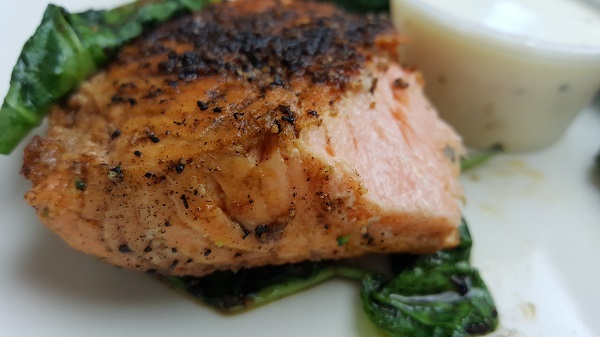 😛 I love grilled salmon though. Such a beautiful super food! 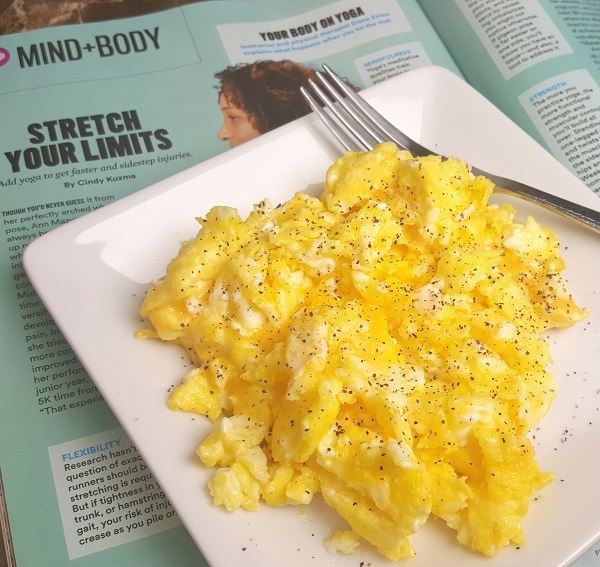 For dinner I had a quick & simple meal of 3 eggs scrambled in real butter, with cheese and a little salt & pepper. 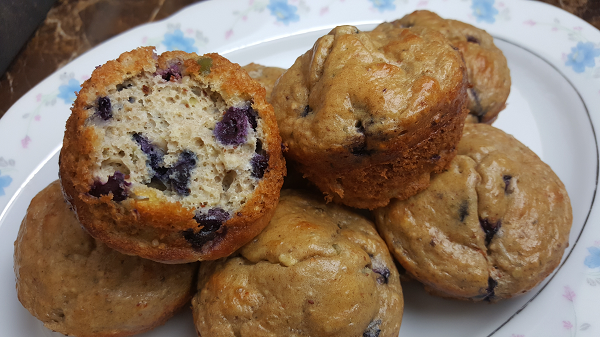 I had a late nap that day, so I was up really late… and decided to experiment in the kitchen in the middle of the night 🙂 with a low carb blueberry muffin recipe! 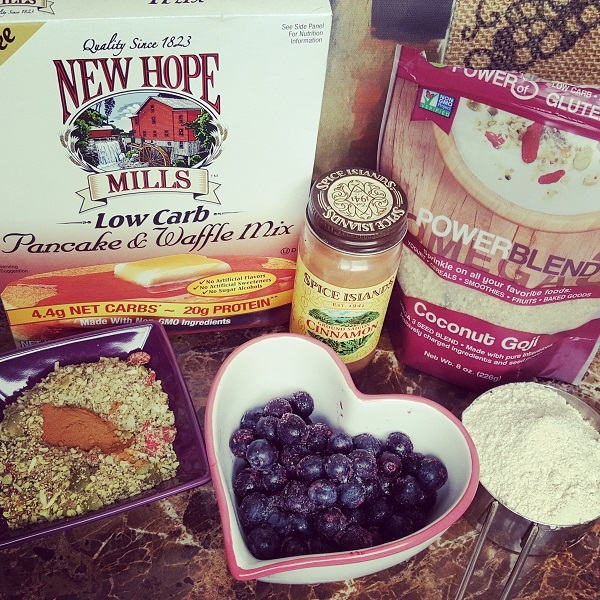 I made the pancake recipe on the back of the box for 2 servings and added 70 grams (1/2 cup) of diced blueberries, 1/2 tbsp of cinnamon, and 3 tbsp of the Coconut Goji PowerBlend (superfood!) 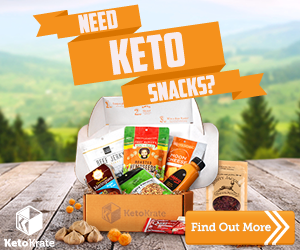 that I got in my March Keto Krate box. 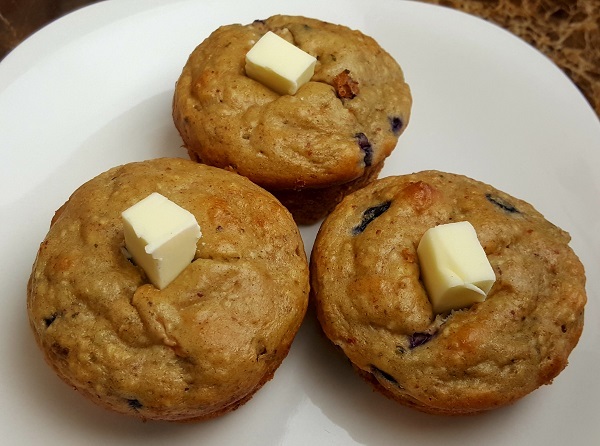 Anyway, I had two of those muffins when they came out of the oven, plus EIGHT mugs of coffee (with Coffe-Mate sugar free hazelnut powdered creamer) that day. I had a full day of consulting and appointments back to back, so I had to grab something quick for lunch. 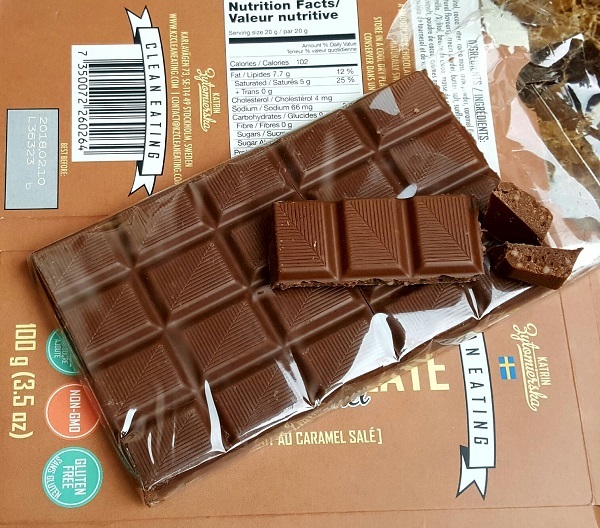 I had a snack pack of Blue Diamond Almonds (1.5 ounces) with 5 squares of the KZ Sugar Free Milk Chocolate Salted Caramel Bar. 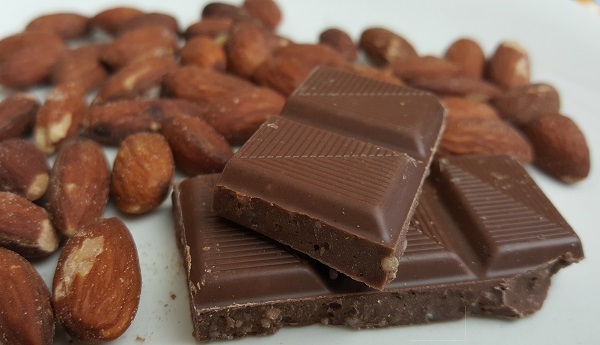 That is the most addictive low carb chocolate I’ve ever had, lol – YUM! Those really added up on me, lol… Oops! Fortunately it’s coming back down now (my weight) but I think I’m going to have to ditch the meds in order to get back into ketosis and back down to my new low weight I worked so hard for. On top of that I really MUST get back to working out, specifically muscle building and strength training. I got so sick during this first quarter so I haven’t been able to be as active as I was, and I’m losing all the muscle tone I’d worked hard for too. Thank you so much for sharing yourself with us. I can’t tell you how much I have related to your posts over the last few years and how much it has helped me. 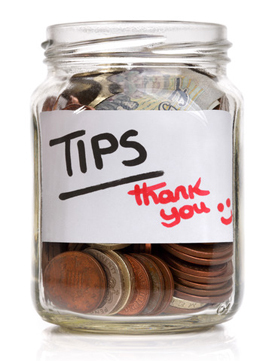 I hope this time I can help you!! I am going through a very traumatic divorce (aren’t they all? ), I am about the same age as you and I also have two kids almost done with college and on their way to adult life. SO, we have a lot in common and I have also been suffering from depression and anxiety! First, I would highly recommend including therapy along with your treatment with the drugs. I have been going weekly for over a year and it has helped me get so much stronger and healthier mentally! It is so important to help with self shame, body image issues, and just stress in general. 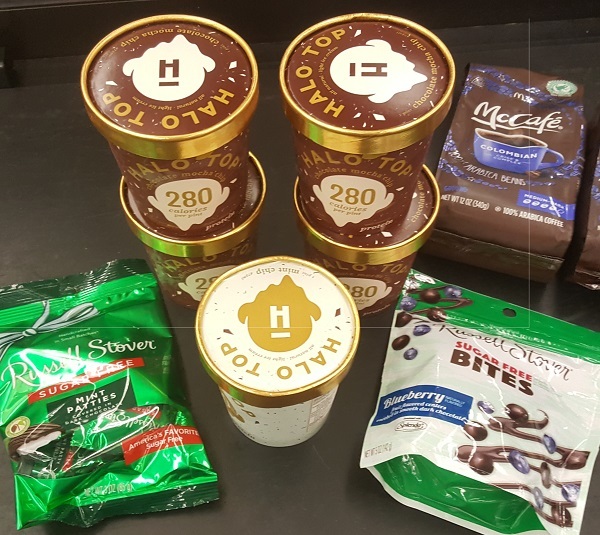 I was first prescribed Wellbutrin, which is the drug that is used in combination with others in the most recent weight loss drugs, so I figured…double bonus! However, I found it had limited effectiveness, even at increased doses. So I asked my primary care doctor if I could see the mental health nurse practitioner for advice. She listened to my story and immediately said, you need a combination of Wellbutrin and Prozac. 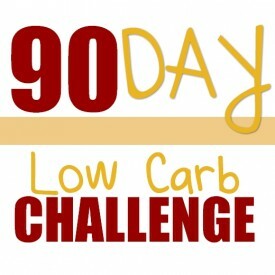 This has worked very well for her patients like me AND almost always has weight loss as a side effect. The key is to be patient…I am three months in and just now seeing the loss begin. Appetite is down and I have the energy and desire to get more active getting to the gym and walking my doggies often (another love we have in common :)). 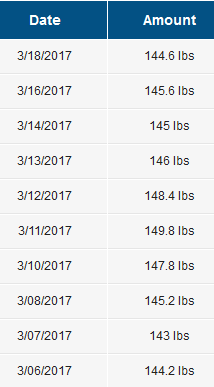 I am still struggling with weight, I am up 25 pounds from my 10 year low this time last year, and I still had 25 more to go then. 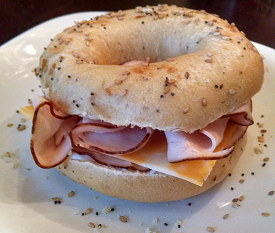 That being said , I am giving myself some time and staying low carb, but not very low carb/ketotic. 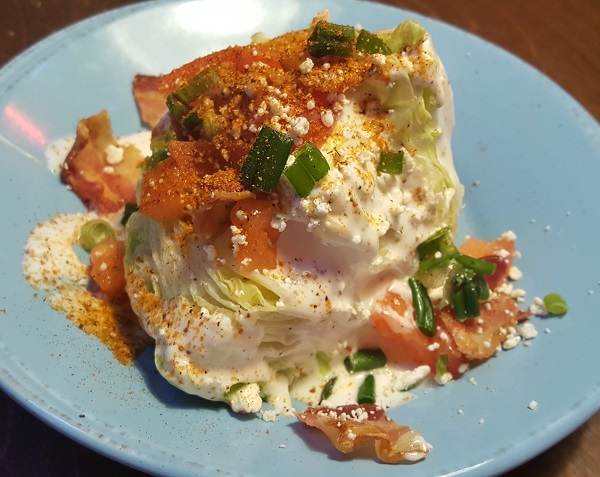 For my past losses, very low carb was the key…and I didn’t go high fat. Thanks to you, I know I will get there some day. Enjoyed your post today..well everday.. but i weighed in today…my last time was feb 18. (i dont weigh weekly, i prefer to use clothing to measure) when i know im working out daily cardio/toning/ treadmill/ eliptical whatever.. clothes fit better…then why on earth is my numbers on the scales NOT moving down?!?!!! Ive also cut out extra snacks, no baking, no SF candies, u have even cut down to 1 caffeine free diet coke in the evening… 1!! I check ketosis strips & no color other then trace. Now mind you, i began doing low carb since Nov 4, 2010 lost down from 245 lbs…im now 167.8 but have been this number for a year now…hello! So i guess just forget the scales & KEEP GOInG! Interesting. 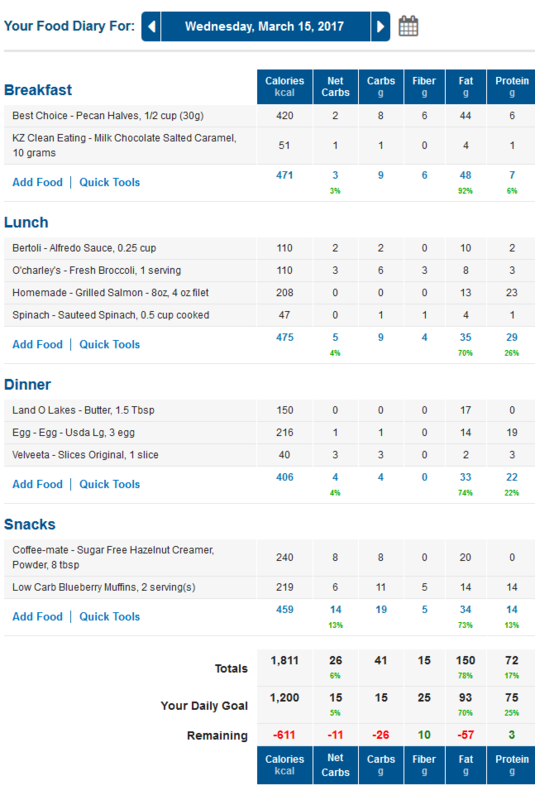 My macros are set same as yours.. however they are a bit lower…as far as what im eating vs what i should be eating. If your clothes fit better, it sounds like you are losing inches instead of pounds. With all that exercise/toning, I would guess adding lean muscle weight and burning fat – so you’ll be leaner and thinner, but the scales may not show much of a difference. 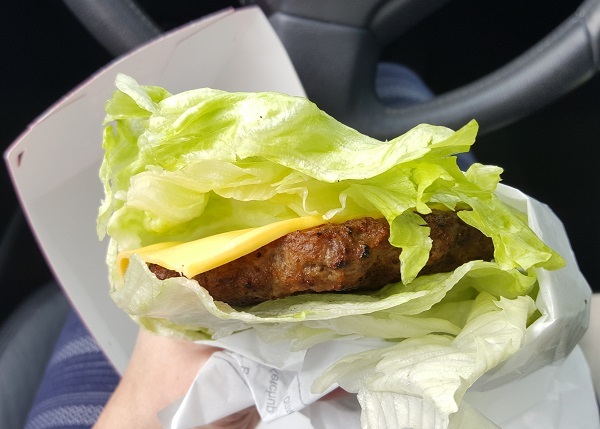 Thank you Lynn… what i should be eating meaning didnt seem like i was eating Enough on some days.. i will just keep on keeping on & go from there. I was so happy to see that you had 5 Michelob ultra beers! Lol. I usually have the same & yesterday we were out on the motorcycle all day at several different places along the beach…Harley Davidson 1st stop (no beer) then off to the Salty goat (2 Michelob Ultras) then off to dinner at Texas Roadhouse (1 Michelob Ultra) then friends called & said meet us at Patches for live band…it was getting late & chilly on the beach & we were still on the motorcycle, so only (1 more Michelob Ultra) so I’m convinced by doing this almost every weekend is why I can get my weight to stay in the 140’s (I’m also using the excuse that I’m 51!!!) Thanks for keeping it real Lynn!!! lol Jill – that’s rare for me, and I’m a lightweight so that was over HOURS of course! It was a fun night though. 😉 Nothing like getting out and letting your hair down every now and then! Love reading your blog! I’m have heart eyes all over those blueberry muffins! 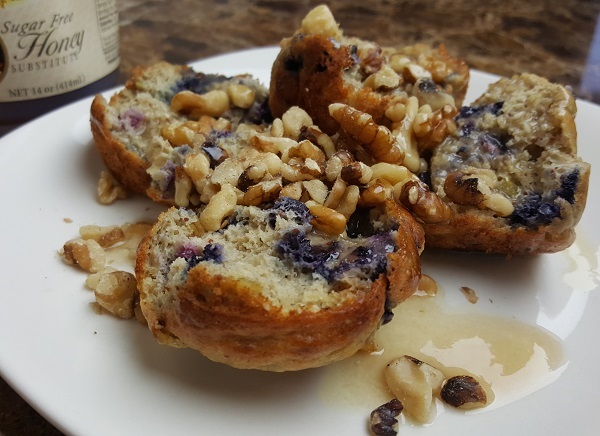 The low carb blueberry muffins were really good. I’m going to make them again with the ideas I shared. 🙂 It’s nice to have something on hand already made & ready to eat! I do a lot of solo hikes & solo adventures, so I take a lot of those photos myself. Usually using the voice commands on my phone to snap the shot, and sometimes I use a small handheld remote (around waterfalls or anywhere else voice commands won’t work due to background noise). Hello, my name is Nicole and I am a 47 340lb woman, that has been in the struggle for YEARS!!! 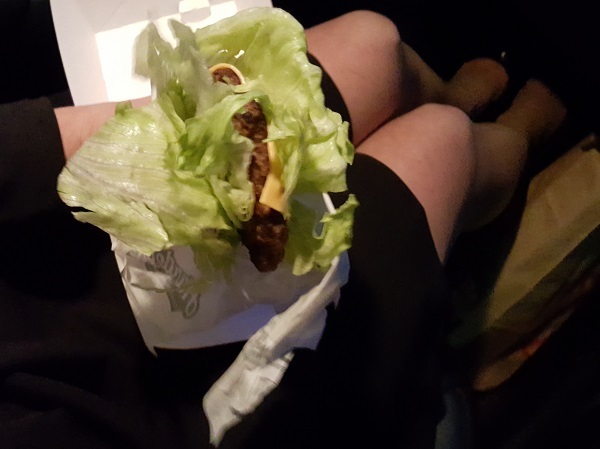 I have been following you on Instagram and have decided to try this way of eating. I have a goal set to lose some weight by July 22 because it’s my 30 yr class reunion!!!! I’m excited and SCARED all at the same time!!!! However, I’m in it to WIN it!!!! That’s a GREAT motivator for your goal, Nicole. 🙂 Welcome!! I felt the same way when I started – excited and scared both – but it’s been the BEST thing I’ve ever done for myself. 🙂 You’ll be SO happy you did this!! 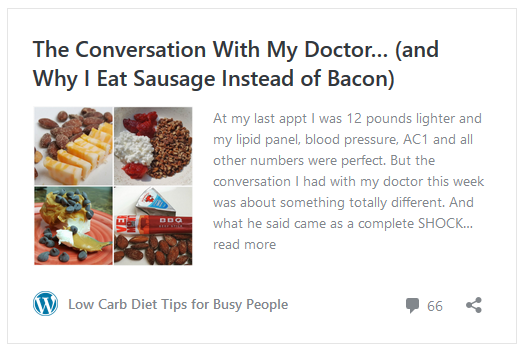 For a little inspiration, here’s a fun story for you: http://www.travelinglowcarb.com/14132/healthy-low-carb-living/ 🙂 Enjoy! !